This was my first trip to the Garage in a long time, having last been there for Obituary and Macabre in December 2012. It has stuck in my memory as one of the warmest venues I've ever been to. I mean it gets ludicrously hot in that place. 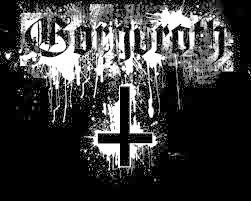 But here I was again, this time for the mighty Gorgoroth. Doors opened at 7, but having been in the pub around the corner and slightly lost track of time, I didn't get there until 7.20-ish, one song into Ethereal's set. I have never regretted being 5 minutes late more. Ethereal are absolutely incredible. Possibly the best opening act I have ever seen, and I do not say that lightly, they are the raw black metal powerhouse that Gorgoroth could have been shown up by. The energy, the darkness and the visceral power of the whole band, not least the near-perfect blackened shrieking vocals, really tied the set together perfectly. A real discovery for me personally, I'll be seeing them again on the 19th at the Unicorn in London, and I'd encourage anyone and everyone who can to go along and check them out. Next up were Ageless Oblivion. I personally don't like to review bands that I don't like so just a quick word on these guys. Just because it's not my thing doesn't mean that someone else would have been as enthusiastic about them as I am about Ethereal. They didn't do anything for me musically, but they had excellent stage presence and they were clearly going down well with some of the crowd. Third up, a band that I had heard of for years, but had never seen or even listened to : Vital Remains. Absolutely unbelievable. I knew there was some connection with Glenn Benton and that Corpsegrinder wears Vital Remains shirts pretty much every time I see Cannibal Corpse, but these guys take all the best elements of Deicide and Cannibal Corpse, and turn it up to maximum. I don't know how some of those growl/shreiks could even be made to be so high pitched by human lungs, but they managed it, and mixed with the most gutteral, bowel-rupturing death-gurgles you have ever heard, Vital Remains absolutely blew me away. I can't believe I hadn't heard them or seen them before, but I'll definitely be seeing them again. Incredible stuff from an amazing band. AND for them to be doing shirts for £15!? Excellent, so I bagged myself a t-shirt. Vital Remains tore the place to pieces. Headlining were Gorgoroth, who I hadn't seen since Bloodstock in 2010, who then had Pest on vocals and were very much there to play a bunch of songs and clear off. I guess it's just the black metal way sometimes to have pretty limited interaction with the audience. This time, Hoest of Taake was guest vocalist, and he absolutely slayed it. Taake are due to play the same venue in May at Incineration Festival alongside Anaal Nathrakh, Carach Angren, Eastern Front and Nargaroth amongst others, and the Garage was given a taster of how intense that night is going to be. Gorgoroth came out and smashed it, with enormous nails dangling from a heavily corpsepainted lineup of musicians peering through the fog of sweat and dry ice. Incipit Satan, Destroyer and Krig bring the Garage to its knees. Again little interaction with the crowd, which might just be a personal thing, but I quite enjoy at least a little acknowledgement from a band I've seen, but let that take nothing away from the intensity of Gorgoroth, proving that Gaahl or no Gaahl, they are still monoliths of black metal. Finally, please go and check out Aeon Promotions. They were the guys who put this night on and who are doing Incineration Fest too. They know how to put on an absolute beast of a night.